"Muy professionales, muy rapida la entrega y todos los productos en condiciones." Black tourmaline on raw quartz matrix. This piece presents a black tourmaline formation in a bar coupled in the white quartz matrix. The stone measures 7 cm x 12 cm x 7 cm and weighs approximately 630 grams. It is believed that the combination of tourmaline with quartz is very powerful to keep the environment healthy and clean energetically. Unique piece. Magnificent cathedral black tourmaline. 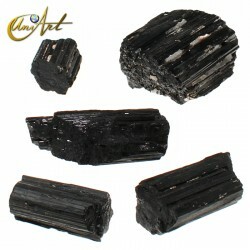 The black tourmaline is a stone of protection for the environment and the people. 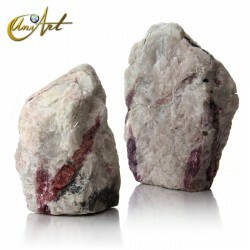 Tourmaline can be used at the entrance to the protection of the environment. This rough black tourmaline measurements are aprox. : 13 cm x 10 cm x 11 cm and weighs 2,150 kg. Origin: Brazil. Variety: Schorl. Flat base. Unique piece. Black tourmaline with quartz crystals. Schorl black tourmaline with quartz crystals. The black tourmaline is perfect against negative energy. As ornamental piece purifies the environment by filtering the irradiations of electrical appliances. Origin: Brazil Variety: Schorl. Flat base. This black tourmaline rough measurements aprox. : 21,5 cm x 14 cm x 9 cm and weighs 4,335 kg. Unique piece. Black tourmaline in raw matrix of white quartz. This piece is composed of a quartz matrix in which two large black tourmaline formations can be seen. This beautiful piece of collection is from Brazil. Approximate measurements: 7 cm high x 19 cm wide x 16.5 cm thick. It weighs 1,560 kilos. Piece of quartz with black tourmaline formation. Beautifuls black tourmalines that has been formed from a quartz matrix. Origin: Brazil. This piece of quartz with black tourmaline measures about 5 cm x 15 cm x 9 cm and weighs about 720 grams. UNIQUE PIECE. We are going to explain the origin of the black tourmaline stone. The term tourmaline has its origin in the Sinhalese word "touramalli", which means "mixed colored stones", whose name was originally applied to a number of stones, primarily zircons. Also, it is thought that its name may come from the Sinhalese word "Turamali", which means "stone that attracts the ashes," which refers to its pyro-piezoelectric peculiarities. 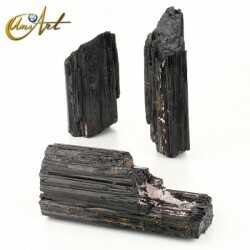 In our shop we have a wide selection of tourmaline stone, specifically black tourmaline, which is ideal to block both negative energies and bad feelings of the people.